Sometimes simpler is better, especially when it comes to emergency tactical situations. The N10 Nylon Duty D-Cell Flashlight Holder provides quick and reliable access to D-cell style flashlights, ensuring no one is caught off-guard in the dark. With its straightforward design, the holster capitalizes on the flashlight's natural weight and shape to offer dependable item retention. With no flaps or covers to get in the way, the flashlight can be quickly drawn and effortlessly holstered in a moments notice. 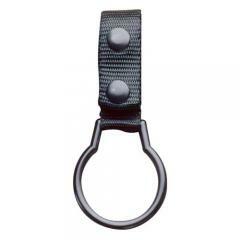 The holder strap is constructed from military-grade nylon and secured to the belt using dual-snap closures. The metal ring is made of corrosion-resistant steel and secures the light, guaranteeing reliable, all-weather use that will last for years.